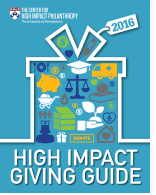 In the “2016 High Impact Giving Guide,” CHIP shares 11 opportunities for philanthropists to make a significant social impact. These opportunities—and nonprofit campaigns—making an impact include missions like nurse home-visits for first-time mothers with low-income and their children, providing vaccinations for measles and rubella for children throughout the world, filling the achievement gap in preschool for low-income children and many more. Under each opportunity, there are sections that explain the nonprofit’s mission, what donors can do to help, how they can personalize their gifts and tips from CHIP. In addition to the 11 opportunities, the report also provides tips to turning donors’ contributions into year-round impact and tips for avoiding fraud. • Remember the difference between a worthy cause and a worthy charity. Come join us for the NonProfit PRO Leadership Conference to hear more about this report, along with additional trends in philanthropic giving, from Anne Ferola, director of education & strategic partnerships at CHIP. The conference is happening on May 17 at the WHYY Public Media Commons in Philadelphia! You can register for the conference here.